"Christmas cancelled!" So says the Antrim Guardian. 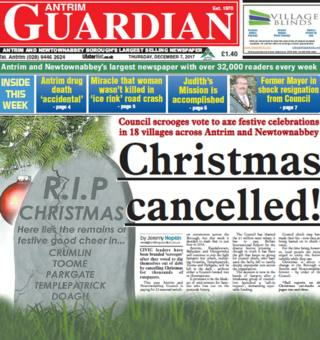 The headline is accompanied by a Dickensian graphic of a headstone: "Here lies the remains of festive good cheer in Crumlin". The outrage is all over a decision to "cancel Christmas for thousands of ratepayers" by slashing the number of Christmas light switch-on ceremonies from 22 to four. The front page says the Scrooge-esque decision is due to debt". Antrim, Randalstown, Ballyclare and Glengormley will continue to light up the sky but towns including Toome, Crumlin, and Doagh will be "left in the dark". The council blames the cut-back on the £1m rate rebate it has to pay Belfast International Airport, the paper says. Further into the paper, the local courts provide one of the more unusual cases seen in Toomebridge. The paper says police found a bottle of stolen vodka in the trousers of a "bare-chested man" in the town. The youth in question was Paul McAleese, 17, from Main Street and was arrested after police received calls about a member of the public who was bare chested in the street. The prosecution said on approaching the teenager, the offending spirit a was found in his trousers. His defence solicitor said McAleese was thoroughly ashamed of his behaviour. He was fined £150 for the theft of the vodka. Some heroic police officers are celebrated on the front page of this week's Mid Ulster Mail. Officers from Magherafelt were alerted to the plight of a child who had gone missing from home. They found the 12-year-old in a local river after a search. Officers had to enter the water due to concerns for the child's safety and health because the water was extremely cold. The child was rescued from the river and taken to Antrim Area Hospital for treatment. PSNI Ch Insp Robinson praised the "outstanding work" of his officers, adding if they hadn't intervened the outcome could have been different. An ancient site in Tyrone is to receive millions of pounds in funding. Mid-Ulster council has announced it approved steps to develop Neolithic landscape stretching from Broughderg to Carrickmore down to Pomeroy. Part of the landscape are the Beaghmore stone circles near Cookstown. Beaghmore means 'moor of the birches' and although they are now in open countryside they would originally have been in the middle of a forest. There are seven stone circles with rows of alignments leading from them and a number of cairns. 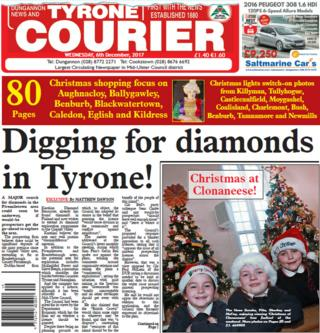 Forget mining for diamonds in South Africa - Tyrone could be the place for a big sparkler, according to the Tyrone Courier. The paper reports that a major search for diamonds in Fivemiletown could soon be under way. A prospecting firm believes there would be "significant" deposits of the stone in Clogher Valley area, extending as fair as Brookeborough in County Fermanagh. The company is applying for a licence, which has been objected to by Mid-Ulster Council. The Department for Economy will get the final say on whether a licence is granted or not. Sinn Féin's Gavin Bell spoke out against the plans, calling them "commercial exploitation", while DUP Cllr Paul McLean said further discussion was needed. It comes alongside a plea for a set of traffic lights from a dad-of-three who "narrowly survived" the collision on the Gilpinstown Road. Conor Treanor tells the paper he is lucky to be alive after his jeep was involved in the crash, in which it span and landed on top of another car. "If I had been driving any faster, that woman whose car I laded on would be dead," he said. 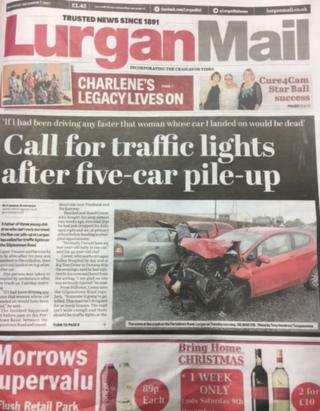 "There should be traffic lights at the Portadown Road." There's been a close shave for 10 bobbies in Lurgan. The brave police officers volunteered to have their locks chopped off for charity. The big shave came after the wife of a former colleague, Dave, was diagnosed with cancer . His kind hearted work-mates took part in a "Brave the Shave" operation to raise money for a charity. Dave said the news of his wife's illness was devastating for all the family, particularly their three children, but they were "staying positive". Fermanagh folk who fancy zipping up to Belfast without having to endure multiple stops may have their prayers answered. 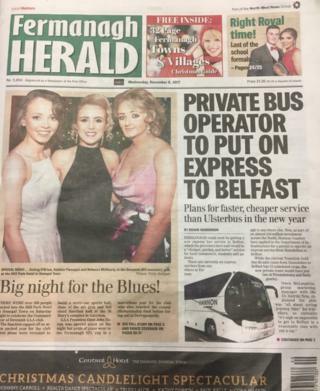 The Fermanagh Herald reports that plans are afoot for a new express bus to Belfast from Enniskillen. There are currently no express services from anywhere in Fermanagh, the paper says. Now as part of £10m investment, a coach company has applied to the Department for Infrastructure for a permit. A decision on the application is expected early in the new year. A Belleck man who kicked and subsequently killed a pet dog last February has been sent to jail. Martin McGonigle, 54, killed the 11-year-old Pomeranian during a dispute with its owner, Patsy Quinn, at Doobally, Ballyshannon. McGonnigle, a part time farmer, was wearing steel toecaps when he kicked the dog. The judge said he had lashed out in full force. McGonnigle told the court it broke his heart that the dog had died, which had not been his intention.